The Clarion Blog will be taking a little break over the winter holidays, and returning on New Year’s Day with a new and improved lineup of exciting guest bloggers, weekly Spec Tech posts, discussions of craft, and writing prompts to fire up your creativity. 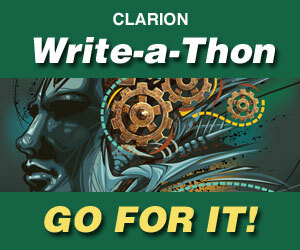 If you subscribe to the blog using the link in the…… Continue reading Happy Holidays from Clarion! The application period for the 2011 Clarion Science Fiction and Fantasy Writers’ Workshop at UC San Diego officially opened on December 1, and will remain open until March 1, 2011. If you’ve been thinking about applying, start tapping on those keys now. We’ve got a wonderful faculty waiting in the wings, featuring Nina Kiriki Hoffman,…… Continue reading Clarion 2011 Applications Open! Spec Tech: Do You Beleve in Magic? Tis the silly season between Thanksgiving and Christmas. In the spirit of the time I offer a short diversion. Here’s my puzzle. In my work as an anthropologist, I have found that people who experience the holy spirit and magic, people who are able to experience God as a person among persons (while still remaining…… Continue reading Spec Tech: Do You Beleve in Magic?